The Newly-Revealed Martyrs of Lesvos, Saints Raphael, Nicholas and Irene, were martyred by the Turks on Bright Tuesday (April 9, 1463) ten years after the Fall of Constantinople. They began appearing to various inhabitants of Lesvos in 1959 and revealed the details of their lives and martyrdom. These accounts form the basis of Photios Kontoglou’s 1962 book A Great Sign (in Greek). In 1451, during a meeting in the French town Morlaix, near Brest in the area of Bretagne, Raphael met a 27 year old Greek law student, Nicholas. Nicholas was born in the year 1424 and raised in Thessaloniki. His Family was comprised of his father Georgios Konstantakis, a lawyer, his mother Anna and his sister Zoe. As recorded in his biography, the Konstantakis family had its origins in the town of Ragoi, Media in Asia Minor. In 1445, Georgios Konstantakis sent his son, Nicholas, to Morlaix, France, to study law at the local university. However, overwhelmed by material pleasures, Nicholas had been spending his time entertaining himself and enjoying social life instead of studying. Nevertheless, by collaborating with Father Raphael and influenced by his exemplary way of living and his valuable advice, he changed his way of life and, eventually became a Deacon. First he became a monk, then, because of his exemplary way of living and his passion for Orthodoxy, Father Raphael ordained him a Deacon and kept him as his assistant, assigning him tasks in different cities, to preach Orthodoxy. In 1453, Saint Nicholas was living in Macedonia with his fellow monastic, Saint Raphael. In 1454, the Turks invaded Thrace, so the two monks fled to the island of Lesvos. They settled in the Monastery of the Nativity of the Theotokos near Thermi, where Saint Raphael became the abbot. In the spring of 1463, the Turks raided the monastery and captured the monks. They were tortured from Holy Thursday until Bright Tuesday. Saint Raphael was tied to a tree, and the ferocious Turks sawed through his jaw, killing him. Saint Nicholas' arms had been tied behind his back; he was hung from a smaller walnut tree in the monastery's courtyard and tortured night and day by the Turks, who beat and stabbed him with their lances. Because of his frail health, Saint Nicholas did not endure the merciless tortures very long, nor the sight of his beloved Abbot Raphael being dragged on the ground and his blood splashed all over the courtyard. He too suffered a heart-attack and died. As Saint Raphael later revealed, their souls went up to Heaven together. He appeared to people near the location of his martyrdom and indicated the spot where his relics were uncovered on June 13, 1960 in Karyes. Many diseases have been reported cured by the intercession of the Saint. Toward the end of November in 1959, Maria Tsolakis and Myrsine Dourgouna saw Saint Raphael in dreams, in which he informed them that in the left front yard, northwest of the ancient church, there was the tomb of Deacon Nicholas, who came with him to Thermi following the invasion of Thrace. He did not, however, indicate the precise spot. The exact place of the grave of Saint Nicholas was revealed in May of 1960. 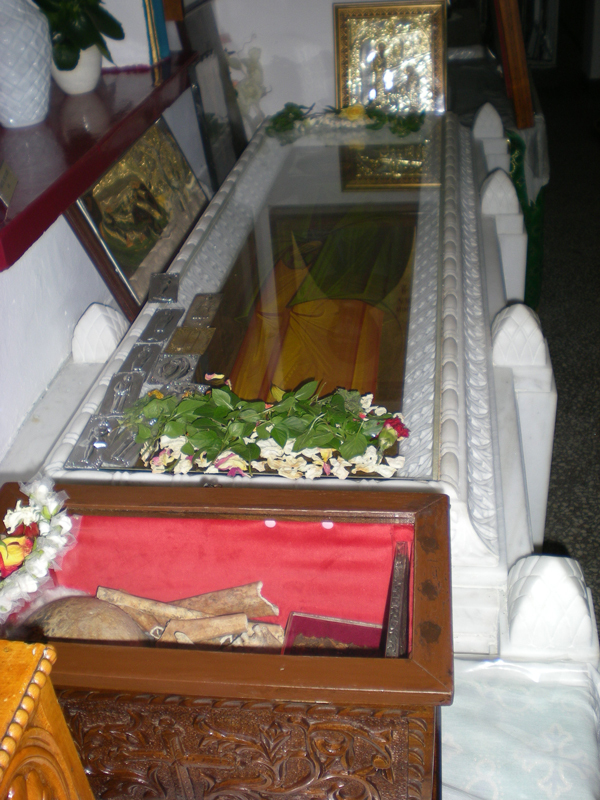 In May of 1960, Myrsine Dourgouna saw Saint Raphael in a dream with another monk. Saint Raphael addressed her and said: "Myrsine, gaze now upon my Deacon Nicholas. Give heed to where his grave is located. You shall remove him on a rainy day." Then it was as if the earth opened, and she saw the grave of Deacon Nicholas. At that moment, she also noticed the monk beside Saint Raphael had vanished. The spot was in the left front yard, northwest of the ancient church. This spot was revealed to other women also, but the wardens of the church did not want to dig there lest they find nothing and suffer reproach. From the week of Palm Sunday, more and more people were recipients of dreams. The messages were all the same; all were shown the identical spot to commence digging for Saint Nicholas' tomb. Vasiliki Rallis had this to say: "In addition to me, the revelation was made to several inhabitants of Thermi - Maria Tsolakis, as well as the sisters Maria and Myrsine Dourgouna, and Virginia Adam (born and raised in Thermi). But we hesitated to recount it to the Metropolitan of Mytilene and to ask for his permission to commence digging. We were afraid to excavate the area lest the tomb should not be found and we become objects of derision on the part of the unbelievers. But we, finally, plucked up the courage and divulged our dreams. After hearing us, the most reverend Metropolitan gave us permission to dig. 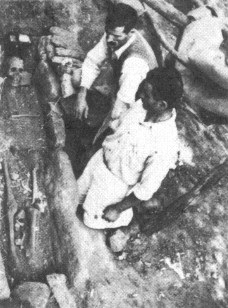 The task of excavating was assigned to Doukas Tsolakis. He was asked to dig at the spot where all of us agreed that the tomb was located, that is, according to the messages we had received in our dreams." Doukas added to this testimony the following: "I maintained that there could not be a tomb there. Why? Simply because the terrain was sloping. But I fell in with their plan and performed a little digging, only to find that the soil was as hard as a rock. I, therefore, stopped the work that day. But later that night, I had a dream in which I was at Karyes. I soon observed a short monk. He was sitting at the spot where I had begun digging earlier that day. This monk addressed me and said, "I am Nicholas. Why do you doubt that my grave is here? Have you forgotten what Saint Raphael did to you? You shall suffer greater punishment from me! The following day, the 13th of June, I went and described my dream to the members of the committee, that is, to those who had commissioned me to dig. After they gave me a patient and attentive hearing, they charged me to proceed with the excavation. I, thereupon, resumed the digging. I was assisted by another workman, named Nicholas Podaras. 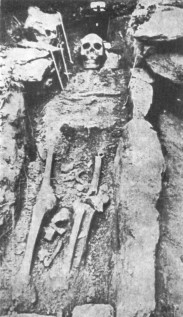 After some difficult digging, the grave containing the skeleton of Saint Nicholas was uncovered. Thus, the 13th of June came to be a day of great rejoicing for the believers, especially those who had been following closely the events at Thermi and Karyes." Indeed, when the grave of Saint Nicholas was discovered, it was raining, just as foretold by Saint Raphael to Myrsine Dourgouna. It was this same Myrsine, who never left the workers side during the excavation in the rain and helped by removing mud and dirt with her hands, that was the first to cry out: "We found it!" upon the discovery. The skeleton was covered in tiles that had to be removed, and while removing them they accidentally broke the left leg. Vasiliki and Myrsine then ran to the village despite the downpour and announced the good news, bringing joy to believers, and silencing the unbelievers. Soon after the discovery, miracles began to take place through the sacred relics of Saint Nicholas. 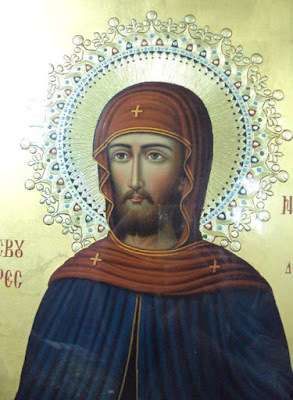 Vasiliki Imvriotou, an elderly woman of the city of Mytilene, upon venerating the relics of the Saint, recovered full use of her paralyzed arm and leg. In another case, a young woman was delivered from a serious infection. In yet another case, a man with a terminal case of tuberculosis was cured at Ayiassos the moment his wife prayed for the recovery at Karyes. The latter healing was confirmed by physicians by means of x-rays before and after the instant cure. 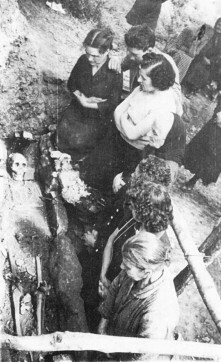 On the day of the discovery, Doukas Tsolakis and Nicholas Podaras remained on guard at the tomb, in company of some women. When they became exhausted, they retired to their homes to sleep, but it became impossible, because in the night they could hear the peal of a church bell from afar, sounding mournful as it does on Great Friday of Holy Week. One of the church wardens also heard the bell. Meanwhile, the following afternoon, Melanthia Voulgarellis, who was one of the unbelievers, before she lay down to take a nap, beheld Saint Nicholas. He was standing upright before her, wrapped in his cassock which was tied with a string. He said: "I am not a Turk, but a saint. The Christians, out of their fear, had buried me hastily. They did not have time to sew me within my cassock. Instead, they placed me in the cassock and wrapped it about me with a string." The Saint then told her that he would work miracles so that the world might believe. Saint Nicholas then departed, and Melanthia went to the Metropolitan and told him what she had heard. He was impressed that an uneducated woman would know of this monastic custom of sewing monastics within their cassocks upon death, confirming that it was indeed revealed to her by Saint Nicholas. The relics of St. Nicholas encased in marble, with the bones of St. Olympia in front.